Spring has finally arrived! Chlorophyl is coming alive causing a gentle breath of green to moisten the winter worn grass as it strains to reach the heat of the ever elusive sun. Along with the struggling grass we see the delicate shoots of the spring lilies pushing their way through the rotting mulch. 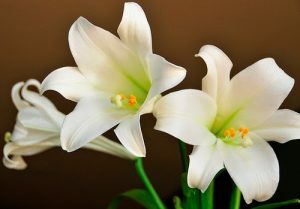 Lilies rise from the dead around Easter and have come to represent this Christian holiday. These are the lilies we will focus on here. Lilies are commonly found in flower arrangements, potted plants and corsages as well as being one of the first flowers to bloom in the spring landscape of many homes. Their beauty, however, hides a deadly truth for our feline friends. The first report of Lily toxicity was reported in 1992 and involved an Easter lily. It is now accepted that all lilies are to be considered nephrotoxic (toxic to the kidneys) of cats. There is no evidence that lilies are toxic in any other species but can cause vomiting in dogs. Almost all reported cases of lily toxicity in cats have been through exposure to in home potted plants and flower arrangements. Both the leaves and the flowers are considered toxic. The actual mechanism of lily nephrotoxicity is not known at this time and there is no definitive confirmatory test for suspected exposure. A very small amount can cause clinical signs of toxicity. The first clinical signs show up 1 to 3 hours following ingestion and include vomiting, salivation, anorexia, and depression. The vomiting and salivation can last 2 to 6 hours but the anorexia and depression can last throughout the syndrome. The next sign that shows up is increased urinating. This usually starts 18 to 30 hours after ingestion. The increased urinating eventually fades to total lack of urine production due to total kidney shutdown which develops 24 to 48 hours post ingestion. At this time vomiting starts again along with weakness followed by recumbency and death. If you see your cat ingest any part of a lily you should contact your veterinarian as soon as possible. Your veterinarian will likely recommend treatment which will include inducing vomiting and activated charcoal. The other treatment for cats that are still producing urine is to give IV fluids for 24 to 72 hours. Once your cat has stopped producing urine, it’s prognosis becomes grave. Dialysis would be the main form of treatment at that time. Other things that can cause similar signs are antifreeze toxicity, acute and chronic renal failure and other toxins that affect the kidneys. If you have lilies in your house try to keep them out of reach of your cats. If you see your cat ingest any part of a lily you should contact your veterinarian as soon as possible. Quick response and treatment are the key to preventing permanent kidney damage and death. If you ever have any reason to believe that your pet has ingested any toxic substance you can contact ASPCA (Animal Poison Control Center) 24 hours a day. 888 – 426-4435. 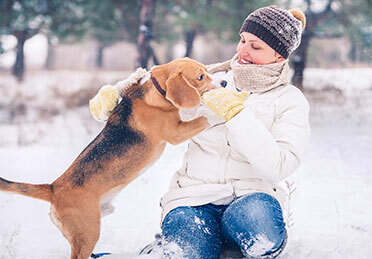 There is a $65 fee to contact ASPCA but once they have a case number they will talk to you or your veterinarian as often as needed at no additional cost.